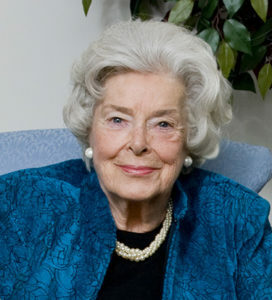 Throughout her life, Mary Jane Leader was a daily example of kindness to others and she inspired all who knew her to do the same for family and community members. She, along with Gov. 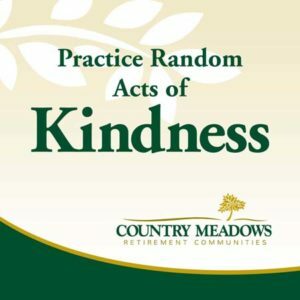 George Leader, founded Country Meadows Retirement Communities and Ecumenical Retirement Community upon treating people with kindness. In her honor, the Leader family encourages residents, co-workers, friends and neighbors to practice random acts of kindness every April—Mrs. Leader’s birth month. “We feel it only appropriate that Mother’s memory live on by encouraging others to remember the little things that can truly brighten someone’s day,” says Leader’s son, Country Meadows and Ecumenical Retirement Communities President & CEO Michael Leader. • Residents passed out candy, flowers and notes of kindness to shoppers at grocery stores. • A co-worker paid for a family’s lunch in The Bistro at Country Meadows. The family was visiting their loved one on hospice for the last time. • A Country Meadows marketing team paid for customers’ coffee for three hours at a local coffee shop. of kindness as that driver paid for the car behind her, and the next two cars in line did the same. Everyone is encouraged to join in the kindness and spread the word. Every April, visitors can pick up free window clings and bumper stickers displaying the simple yet powerful message, “Practice Random Acts of Kindness.” Kindness cards also are available to give to those in need of a pick-me-up. I would love to pick up a window cling from your facility on Green Pond Road but don’t know what door to use. Ms. Snyder, we are glad you are interested in one of our clings. They are very popular and inspiring. We have copied you on a separate email to our Bethlehem team with specifics on where to pick one up. Please be on the look out in your email for those details. Thank you again and enjoy practicing kindness. We sure do. with travels world wide speaking at confrerences on senior housing, I have met some thousand people or more. A very few stand out in my mind or encouraged me to follow in his or her footsteps. Mrs. Leader is on the top of my list as a great mother, wife, inspiring human being. I was Blessed to have had her in my life. One person CAN make a big difference in life. Ms. Nicusanti, many many thanks for sharing your wonderful compliments of Mrs. Leader. She truly made a difference with our residents and co-workers. We all were blessed to have her in our lives. We will be sure to share these compliments with the Leader family. Thank you again. Your mother was indeed a wonderful woman. She was always so gracious and very inspiring! I feel it is more important than ever to practice random acts of kindness. Every individual has this capability, even if it’s only a kind word. Keep up the positivity. It’s contagious and will inspire others, as your mother intended. My mother also taught me this, so in honor of both our mothers, I definitely want to display these stickers in the hope they will inspire others! Ms. Leidy, we couldn’t agree any more about the virtues of kindness and Mrs. Leader’s inspiring examples of that. Thank you for taking the time to share your kind comments. We will be sure to share with the Leader family.